The Net Promoter Score (NPS) is a customer satisfaction, customer experience and loyalty indicator that measures the likelihood of customers recommending a company, product or service to a friend or colleague. 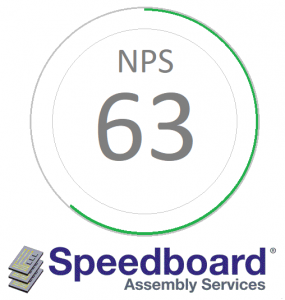 The NPS is calculated based on responses to the primary question: How likely is it that you would recommend Speedboard to a colleague or another business? The scoring for this answer is based on a 0 to 10 scale. Passives (score 7-8) are satisfied customers but are unlikely to actively promote your service. Subtracting the percentage of Detractors from the percentage of Promoters yields then Net Promoter Score. We are delighted to report a NPS of 63% following our very first NPS survey conducted in March 2018. The collective score we received is the highest published score in our industry and is significantly higher than the average for all manufacturing sectors. We engaged an independent consultant to call at least three key customer contacts at each of our customers. These included the CEO, Head of R&D and our daily point of contact.